St. Francis Prep, Fresh Meadows, is known for producing top-notch basketball talent that thrives at the collegiate level. Meanwhile, St. Joseph’s College Brooklyn, Clinton Hill, has become a hot bed for local CHSAA basketball players to continue their hoops careers. Sounds like a perfect match, right? Well this fall, four L’il Terriers basketball players – guard/forward Sebastien Etheart, guard/forward Stephane Etheart, guard Dimitri Sirakis and forward Lauren Quesada – enrolled as freshmen at St. Joseph’s and have begun the next chapter of their basketball journeys. Both the men’s basketball team, coached by Joseph Cocozello, and the women’s squad, coached by Tom Flahive, at St. Joseph’s have heavily recruited players from the local Catholic league, since they know the schools do a fine job of developing young men and women for the next level. In just several weeks of practices, the players have already seen many similarities to their high school program, which has greatly helped in the transition process. The hands-on approach taken by the St. Joseph’s program has been a major draw for local players, especially those that experienced that same feel in high school. 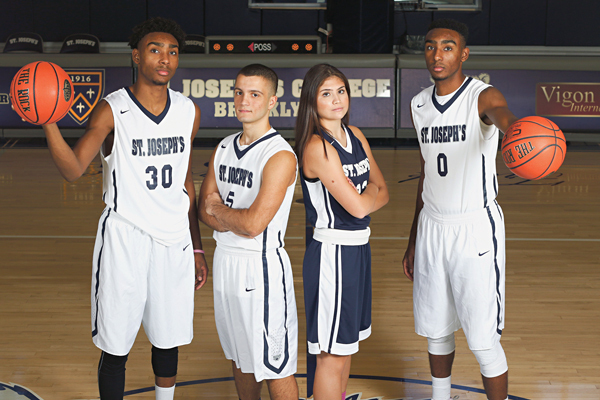 A unique aspect of the St. Joe’s teams is that a good majority of the roster all played in the local CHSAA. For these L’il Terriers, playing with former rivals now as teammates has been a welcome experience. The St. Francis Prep community must be extremely proud for playing a role in the development of these four student-athletes, and St. Joe’s is just as lucky to now have them as students.